Government surveys have found that people who drink diet beverages average more than 26 ounces per day (some drink far more) and that 3% of diet-soda drinkers have at least four daily. (Health.com) -- First thing every morning, Ellen Talles starts her day by draining a supersize Styrofoam cup filled with Diet Coke and crushed ice. The 61-year-old from Boca Raton, Fla., drinks another Diet Coke in the car on the way to work and keeps a glass nearby "at all times" at her job as a salesclerk. By the end of the day she has put away about 2 liters. "I just love it," she says. "I crave it, need it. My food tastes better with it." Talles sounds a lot like an addict. Replace her ever-present glass of Diet Coke with a cigarette, and she'd make a convincing two-pack-a-day smoker. In fact, she says, she buys her 2-liter bottles 10 at a time -- more if a hurricane is in the offing -- because if she notices she's down to her last one, she panics "like somebody who doesn't have their pack of cigarettes." Most diet-soda drinkers aren't as gung ho as Talles, but people who down several diet sodas per day are hardly rare. Government surveys have found that people who drink diet beverages average more than 26 ounces per day (some drink far more) and that 3% of diet-soda drinkers have at least four daily. Are these diet-soda fiends true addicts? And if so, what are they addicted to? The most obvious answer is caffeine -- but that doesn't explain the many die-hard diet drinkers who prefer caffeine-free varieties. Factors besides caffeine are likely at work. Although diet soda clearly isn't as addictive as a drug like nicotine, experts say the rituals that surround diet soda and the artificial sweeteners it contains can make some people psychologically -- and even physically -- dependent on it in ways that mimic more serious addictions. And unlike sugared soda, which will make you gain weight if you drink too much of it, zero-calorie soda doesn't seem to have an immediate downside that prevents people from overindulging. "You think, 'Oh, I can drink another one because I'm not getting more calories,'" says Harold C. Urschel, MD, an addiction psychiatrist in Dallas and the author of Healing the Addicted Brain. "Psychologically you're giving yourself permission." Caffeine can't account for Steve Bagi's habit, however. The 44-year-old graphic designer from Chester Springs, Pa., gets his morning buzz from an enormous cup of coffee, yet he still buys caffeine-free Diet Pepsi by the case and downs six cans a day, "easy." His Diet Pepsi cravings stem from a prior addiction to nicotine, not caffeine. "It's all tied to smoking," says Bagi, who smoked a pack a day for 20 years and started drinking diet soda to mask the aftertaste of cigarettes. He eventually kicked the smoking habit -- but the Diet Pepsi one stuck. Trading one addiction or compulsive behavior for another -- a phenomenon known as addiction swapping -- is a well-known concept in addiction medicine, one that may explain Bagi's experience and that of other heavy diet-soda drinkers. Many people who drink diet soda are trying to lose (or keep off) weight by eating healthier, and they may turn to the sweetness of diet soda for comfort as they scale back on sugar, carbohydrates, and other satisfying foods -- much like a heroin addict who steps down to Oxycontin, Dr. Urschel says. Similarly, people may get hooked on diet soda because they associate it with a certain activity or behavior, as Bagi did with smoking. "You can get into a situation where you crave a diet soda by conditioning yourself," Dr. Urschel says. "[If] you stop for gas and always get a diet soda, the craving will start to come first, before you even pull into the station." The psychological components of diet-soda cravings are powerful, but they aren't the whole story. Research suggests that the artificial sweeteners in diet soda (such as aspartame) may prompt people to keep refilling their glass because these fake sugars don't satisfy like the real thing. In a 2008 study, for instance, women who drank water that was alternately sweetened with sugar and Splenda couldn't tell the difference -- but their brains could. Functional MRI (fMRI) brain scans revealed that even though both drinks lit up the brain's reward system, the sugar did so more completely. "Your senses tell you there's something sweet that you're tasting, but your brain tells you, 'Actually, it's not as much of a reward as I expected,'" says Martin P. Paulus, MD, a professor of psychiatry at the University of California San Diego, and one of the authors of the study. "The consequence might be that the brain says, 'Well, I'll have more of this.'" In other words, artificial sweeteners may spur drinkers -- or their brains -- to keep chasing a "high" that diet soda keeps forever just out of reach. It's not clear that this teasing effect can lead to dependence, but it's a possibility, Dr. Paulus says. "Artificial sweeteners have positive reinforcing effects -- meaning humans will work for it, like for other foods, alcohol, and even drugs of abuse," he says. "Whenever you have that, there is a potential that a subgroup of people ... will have a chance of getting addicted." Timothy S. Harlan, MD, a nutrition specialist and assistant professor of internal medicine at the Tulane University School of Medicine in New Orleans, says that while diet-soda dependence appears to be a real phenomenon, it is probably caused by a complex mix of behavioral factors, not necessarily artificial sweeteners. "I don't think there is clear-cut evidence of biochemical dependence on diet soda, but my sense is that certainly people do become habituated to diet soda and dependent upon it," he says. According to the American Psychiatric Association, a key sign of substance dependence is when a person continues to use a substance even when he or she knows it's causing physical or mental health problems. Talles fits this description. She was diagnosed with brittle bones about six years ago, and her internist urged her to quit Diet Coke because the phosphoric acid in soda -- both diet and regular -- leaches calcium from bones, which can make osteoporosis worse. She's not having it, though. "It's not like I smoke or have any other bad habits," she says. "This is my thing." All the same, Talles acknowledges that drinking so much diet soda is probably not good for her, so in the last couple of months, she's started substituting one of her daily Diet Cokes for a caffeinated Crystal Light. Another distinguishing feature of substance dependence -- whether it's to caffeine, nicotine, or hard drugs like heroin -- is the painful withdrawal symptoms that occur if a person tries to quit cold turkey. Although it's difficult to pinpoint whether aspartame, caffeine, or some combination of ingredients is responsible, people who cut back on diet soda report symptoms such as headaches, nausea, and irritability -- a feeling that Talles knows well. She still remembers with horror a European vacation in 1982 during which she couldn't find diet soda for weeks. (This was still the infancy of diet soda; Diet Coke had just been released.) "I felt terribly lethargic and I had a headache," Talles recalls. "I tried to drink tea, but it didn't work the same way. ... I was having terrible withdrawal." When she finally found a vendor who sold Tab, four weeks into the trip, she bought every can he had. Catharina Hedberg, the owner of the Ashram, a wellness retreat nestled in California's Santa Monica Mountains, has seen what she believes is aspartame withdrawal firsthand. She claims that as many as 20% of the people who visit the Ashram are "totally addicted" to aspartame, mainly from diet drinks. "Withdrawals are horrendous," Hedberg says, even among those who drink caffeine-free diet soda. Before guests arrive at the retreat, Hedberg sends them a packet of literature that, among other things, encourages them to stop consuming diet soda and other products that contain aspartame. 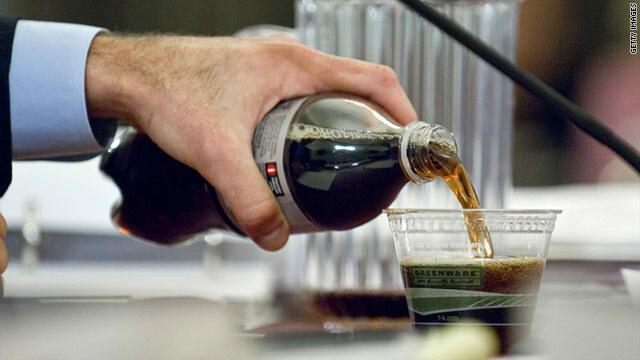 Although her observations are admittedly unscientific, Hedberg says that people who drink a lot of diet soda tend to experience nausea (and sometimes even vomiting) one to two days after arriving at the retreat, whereas coffee drinkers typically just get headaches. Whether you feel dependent or not, drinking too much diet soda might be risky in the long run. In recent years, habitual diet-soda consumption has been linked to an increased risk of low bone mineral density in women, type 2 diabetes, and stroke. What's more, a growing body of research suggests that excessive diet soda intake may actually encourage weight gain. Health.com: Can diet soda boost your stroke risk? Researchers are still trying to sort out the counterintuitive link between zero-calorie soda and weight gain. One explanation may be that as your body gets used to experiencing the sweet flavor of diet soda without absorbing any calories, it begins to forget that foods containing real sugar and other carbohydrates do deliver calories. "The next time you go for a piece of fruit, your history says, 'I don't know if this has calories or not,' so you track those calories less well, and you may eat more of them," says Susan Swithers, PhD, a professor of psychological sciences at Purdue University in West Lafayette, Ind. If a relationship between diet soda and unhealthy food choices does exist, it may not be a total coincidence. There is some speculation -- largely unconfirmed, as of yet -- that diet sodas have subtle effects on insulin and blood-sugar levels that trigger hunger and food cravings and influence how (and what) you eat. None of this, however, is enough to persuade Talles or Bagi to swear off their habit. They simply have a hard time imagining life without diet soda. "I'd like to quit, and I know my wife would like me to," Bagi says. "I would like it to happen within the next year, but I'm not counting on it." Additional reporting by Carina Storrs.